To remain competitive in an increasingly customer-centric world, mid-sized organizations are undergoing digital transformations of their contact centres. 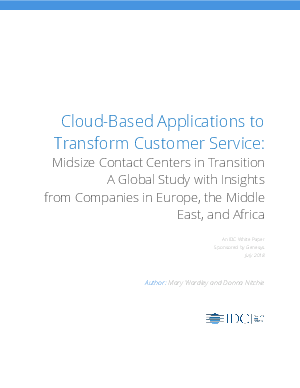 IDC surveyed companies in 27 countries globally, including companies from Europe, Middle East and Africa (EMEA), to examine the current market dynamics of cloud-enabled customer service environments. Eighty-five percent of the respondents fell within the small to mid-sized category with contact centres with 300 seats or fewer.